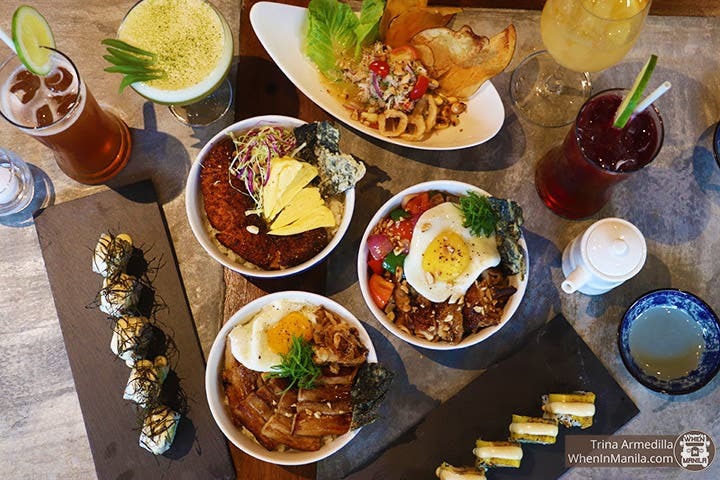 The fun hangout place is a hybrid between a restaurant and a meat place, inspired by the owners’ love for both food and good drinks of Migz Del Gallego, Mikey Presa, Anna Villanueva, Con Mendoza and Thina Mendoza. This new dining experience was inspired by the success of their other concepts, where they serve up approachable cuisine that is especially appreciated by meat-lovers. Their collective experience in the food industry, combined with their entrepreneurial chutzpah have led them to open Concepto, where customers can choose their meats from a range that includes prime cuts such as USDA Rib Eye, Porterhouse, Sirloin, Tenderloin, Tbone all the way to 48 hours marinated Porkchops, Pork Belly and Smoked Maple Bacon and then have it cooked to their preferred doneness at only Php 100 cooking charge; with choices of sauces and sides. Planning for a party? Looking at something that’s not on the menu? Chill, Concepto can customize the menu just for you! The other menu items are throwbacks to their road trips, with dishes that they cooked along the way, Migz shares. The best sellers include Mikey’s Chili (8 hour simmered ground beef topped with sour cream, cheese and cilantro, with fried tortilla on the side), Roast Beef Adobo (Roasted garlic with adobo jus, served with fried potato or rice), and the Spicy Binagoongan (Sautéed with 3 kinds of chili with green mango salad and crispy wanton chips). The meaty menu items are meant to be enjoyed with cold drinks and savoured with the music courtesy of hot bands who has performed at Concepto such as Thyro and Yumi, Kiko Salazar, Miro Valera (of Stonefree), Kat Agarrado (of Sinosikat? ), Hans Dimayuga, Jem Cubil, Ramonne, Inky de Dios and more. They also have open mic nights where you can sing your hearts out every Thursday! To add a hearty party flair, they mix it up with DJs too, with regulars JJ Saur, Marxx Monterola, Supmerman, Daxx, DJ ZelleAbella and San Francisco DJ Steelo. Up for a chill night? They also have quiz nights every Tuesday with the winner getting a bottle free (plus bragging rights of course)! Experience a new level of fun dining at Concepto Poblacion, located at 6234 Mañalac Street, Poblacion, Makati. The hottest place to chill opens at 5:00 PM – 2:00 AM (during Weekdays) and extends until 3:00 AM on Weekends. For more information, visit ConceptoPoblacion on Facebook and Instagram (@ConceptoPH), call them at +6327459343/+6326891656 or email them at conceptophilippines@­gmail.com. The Party Bus Manila Does Halloween: Get Spooked!